This is a nice looking refrigerator, but not very durable. After about 5 years the ice maker went out freezes over, but the motor to dispenser the ice not longer working. Around the same time, the railing for the two drawers cracked. It was not a cheap replacement since you have to purchase the entire bottom shelf as a replacement. Way too soon for these things to go down. 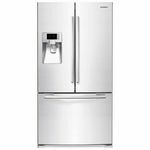 This fridge is durable and long-lasting but has some minor kinks. Noise Level Sometimes it makes strange humming noises, but normally it is quiet. Temperature Control It is very easy to control the temperature. Ease of Cleaning The spaces are pretty wide, making it easy to clean. Durability Our fridge has lasted for at least several years already. Don't like the set up. Maybe it's just the way my family packs things in a refrigerator, but I couldn't seem to make good use of the space. The shelves are so close together, a lot of things have to be laid down, which means that things are forgotten about, and harder to reach in the back. Then food spoils, and we lose money. The front water dispenser and ice dispenser is nice and convenient, although INCREDIBLY noisy. You can hear it upstairs when someone gets ice. My filter seems to go bad a lot sooner than it should as well. The freezer is nice and cold, but again, an odd layout. I have broken the shelves and door numerous times because of the way food fits in it and the way you pull out the freezer drawer. 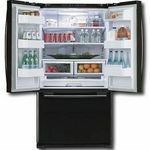 Overall, if you have a lot of kids and a lot of leftovers and beverages, it just might not be the refrigerator for you. Unless perhaps you're organized, we are not too good at organizing things. The build of the refrigerator seems a little cheap as well. I really love the lay out of this refrigerator. Lots of space, I love the freezer on the bottom. The only problem is the ice maker. It is a complete mess. It just stops working. We have had a tech out to look at it and he suggested to just replace it. We have not replaced it yet, because it does work sometimes. Even when it is making ice, the bucket does not hold very much at a time. Our family of four typically use all the ice at one meal. Over all, it is a great fridge. Noise Level Most of the time it is great. Sometimes the ice maker is noisy. Interior Organization Love everything about the layout. Lots of room for everything. Even storage in the doors. Freezer has a pull out drawer and storage on the door. It is great. Temperature Control Great, easy to adjust on the door. Ease of Cleaning Everything pulls out-doors, shelves, etc for easy cleaning. Durability Everything works great with the exception of the ice maker. Which will probably need to be replaced soon after 2 years of use. Design Love it ! Looks great and works great. Love this refrigerator! Has plenty of room, love the French door design, easy to put food away or find it when needing something quickly. Love the sliding shelves. I also love the water filter. Noise Level Very little noise except when ice drops! Interior Organization Love the sliding shelves in the refrigerator and the freezer has removable compartments and a place to store pizza boxes. Temperature Control Not very easy to adjust the temperature. Our freezer is to cold. I have tried adjusting the temperature according to the manual and have made the freezer colder. Ice cream freezes so hard we have to leave it out to soften enough to scoop out. Ease of Cleaning Everything is open and easy to reach. Wipes clean easily. Durability Very durable. Doors close by themselves if left open. Design I love how this opens up and it is so easy to reach and find things. We are so happy we chose the french door style refrigerator much nicer than the side by side. There is a huge amount of freezer space. We also love the water dispenser because any size cup can fit in getting water out of it. We have also been happy with the water filtration and enjoy the taste of the water (we have replaced the filter once). The drawers and trays are easily removed for cleaning. I also like the black instead of the stainless steel...doesn't show as many smudges. 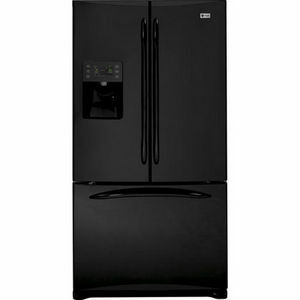 We purchased the black GE Profile bottom freezer french door fridge when we moved into our new home 2 years ago. We chose it because we liked the fact that you could fit large platters in either the fridge or freezer portion. Previously we had always owned side-by-side fridges. 1st, the ice production is HORRIBLE and VERY noisey! During the summer, it barely even keeps up with 2 adults & 2 kids. Any time we have more than us 4 around, we have to purchase extra ice. The smooth front has been a really problem with kids (sides have a texture to them). It has scratched up very easily and I've yet to find a way to buff those scratches out. Wish there was a texture to the front surface. The full-width bottom deli drawer of the fridge requires you to have both french doors opened all the way to get anything out of it and has been more annoying then me had planned on it being. It is also very easy to get it pushed in slightly at an angle and then is difficult to open & shut. The bottom fridge drawer is the only we have had any problems with coming off it's track. I feel that the filter has lasted a decent amount of time. We regularly use the in-door water and have only had to replace the filter twice in 2-years. We also like (and often use) the flip-up feature on the small shelf located next to the ice maker. It is very handy to just flip it out of the way to accomidate taller items. I, personally, would keep looking rather than purchase this same fridge again. It does have a couple nice features, but there are also some big draw-backs (in my opinion). This GE Profile PFSF6PKX is wonderful - roomy, cold and quiet! 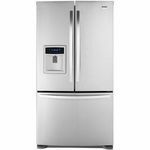 I was surprised to see so many mixed reviews on the GE Profile refrigerators. 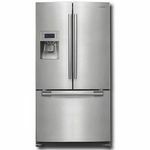 The GE Profile PFSF6PKX is our second GE Profile refrigerator, and we couldn't be happier! 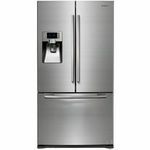 The GE Profile PFSF6PKX has an icemaker - somewhat unusual for a french-door, freezer-on-the-bottom refrigerator. While it doesn't make a LOT of ice, it makes enough for our four-person family. If we're having a party, we buy extra ice for sure. I have found the freezer to have plenty of room, and I am a person who "stocks up" at the grocery store! It is sometimes difficult to find items, but that is just how it goes when most of your items are in a big drawer! There is a smaller pull-out drawer I use for my children's easy to reach items. No complaints from us on this freezer!